1. Preheat the oven to 160ºC, gas mark 3. Remove any remaining scales on the salmon fillet and generously butter your largest roasting tray. Lay the salmon on the tray skin side down. 2. Gently rub the salmon fillet with the remaining softened butter, and season generously with sea salt and pepper then pour in the chicken stock. Bake in the preheated oven for about 15-20 minutes, until cooked through then take out, drain off excess liquid and and set aside to stand. 3. Meanwhile for the parsley crust, melt the butter in a frying pan, tip in the breadcrumbs and fry until golden brown in colour. Remove from the heat and stir in parsley, then season generously. 4. For the red pepper sauce, heat the rapeseed oil in a pan and fry the chopped peppers until soft, then add the white wine vinegar and bring to the boil. 5. Using a hand blender or liquidiser, blitz the peppers to a purée then pass through a sieve. 6. Brush the salmon fillet with some of the pepper purée and pour the rest into a small saucepan with the double cream and bring up to the boil. When it starts to thicken remove from the heat and beat in the cold butter - a couple of cubes at a time - until smooth and thickened. Season to taste. 7. 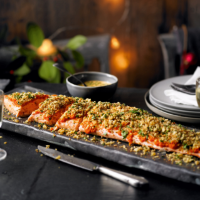 Sprinkle the salmon fillet with the parsley breadcrumbs and transfer to a serving dish. 8. Stir the chives into the butter sauce and serve a little around the fish, pour the remainder into a bowl and serve alongside the fish. This recipe was first published in Tue Nov 04 12:48:00 GMT 2014.